After many generations of dealing with the Synoptic Problem, the overwhelming conclusion of New Testament scholars is that the Gospel of Mark was the earliest canonical gospel. I accept this view. It is also quite evident to me that the order of production was Mark – Matthew – Luke. The synoptic schema favored by M. Klinghardt, adapted from his 2015 volumes (I:272). Klinghardt postulates one or more pre-Marcionite/proto-canonical gospels. While Klinghardt considers the Gospel of Marcion (“Mcn”) to have been a text and dates it 90–150 CE, the present writer considers it a theology (“gospel” in the general sense). The purpose of this series of posts is to attempt a reconstruction of “Ur-Mark” as postulated above. It is now also clear to me that all the canonical gospels were written in the second century, not the first. They presuppose the existence of brick and mortar synagogues, of Pharisees in the Galilee, and they reflect a time when Catholic Christianity had already moved into the diaspora and was no longer Jewish in any meaningful sense. (2) the “Catholic” Gospel of Mark was written in response to, and in repudiation of, Marcion’s theology. While I disagree with some views presented in Hoffmann’s book, the above seems correct to me. 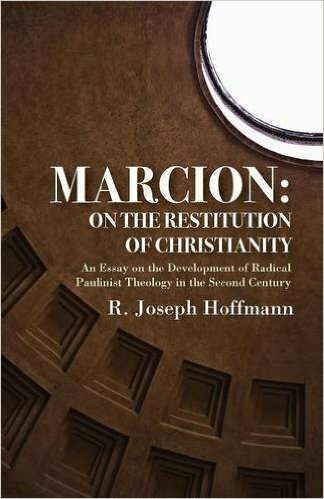 Hoffmann goes on to detail passages in the canonical gospels that can be convincingly explained as rebuttals of Marcion’s theses. Those theses, as we know from the voluminous writings of the Church Fathers (especially Tertullian), included Marcion’s belief in a wholly spiritual and transcendent god, one that has no truck with the creation or with materiality. This, of course, could not be the god of the Jews, and hence Marcion placed a wedge, as it were, not merely between the transcendent god and Yahweh, but also between the new Christian religion and Judaism. I have also argued on this website (here and here) that Marcion’s theology belonged to the christology I have labeled “Stage 2.” This christology did not yet know Jesus of Nazareth, the unique and all-powerful Son of God. Rather, Stage 2 christology knew a spiritual Jesus that indwells the human being. This conception (also known to Paul) dovetails perfectly with Marcion’s view of a spiritual, transcendent god who has nothing to do with the material creation. According to Marcion’s view, then, we have a divine, life-saving Jesus indwelling a worthless body and descending into a hostile, uncomprehending world. That, indeed, is the detectable core of the Gospel of Mark, after later Catholic accretions are removed. I have now attempted to remove those accretions—which actually make up most of the extant gospel. When the scissors are finally put aside and the chopping is done, what we are left with is a short and stunning “core” to the Gospel of Mark, one very different from the received text. In an entirely provisional way, I will present that core in the posts to follow. It is not my contention that such a hypothetical “core Gospel of Mark” ever existed in the form to be presented in the coming posts. Even less am I suggesting that this “core” is equivalent to a written Gospel of Marcion—elsewhere I have strenuously argued that no such written “Gospel of Marcion” ever existed (contrary to modern scholarly opinion). 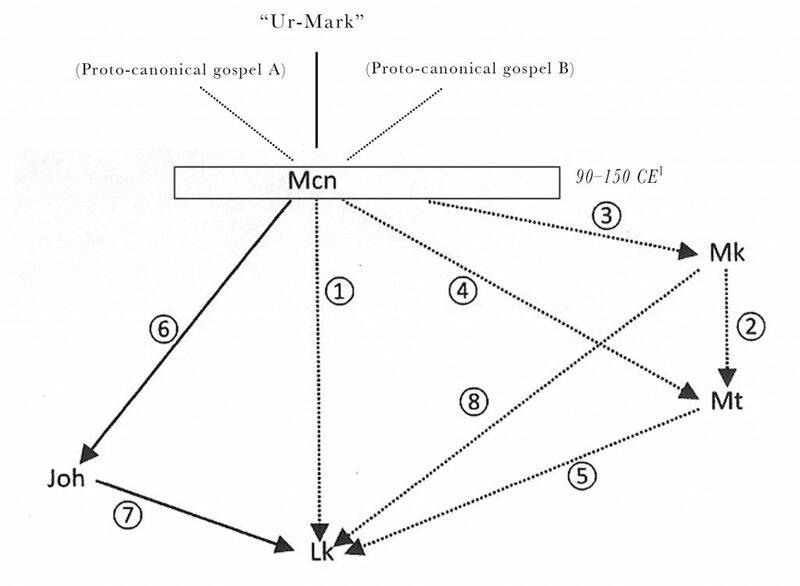 Rather, I am attempting something different here: to begin the work of reconstructing a text (“UrMark”) that some scholars suppose Marcion knew and used as the basis for his theology. This view is very old. In the nineteenth century A. Ritschl, F. C. Baur, G. Volckmar, A. Hilgenfeld, and T. Zahn all supported the idea that Marcion was dependent on a textual prototype to the Gospel of Mark (Hoffmann, op. cit, xii). The Oxford NT scholar William Sanday concluded that Marcion had access to different versions of “Luke.” We may wonder: Are not GMark itself, and its earliest prototype, different versions of “Luke”?